Dow Jumps Higher After Trade War Pause, Will Markets Go Even Higher? 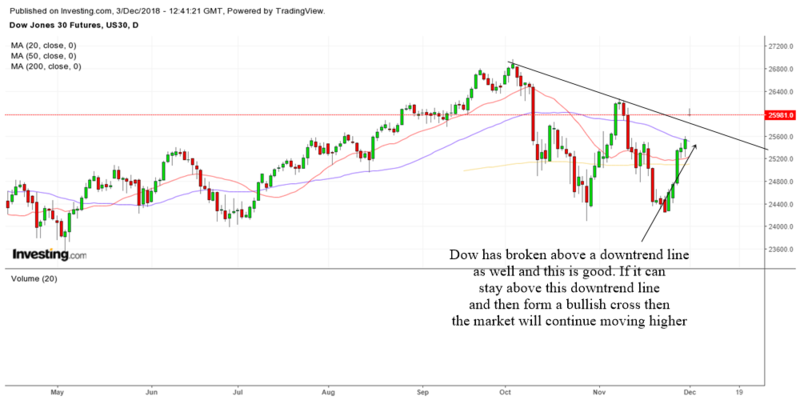 With an agreement to pause the trade war, Dow is about to jump 450 points higher, but will this rally sustain and go even higher? Lets take a look at the charts. The chart above shows the daily chart of the S&P 500. 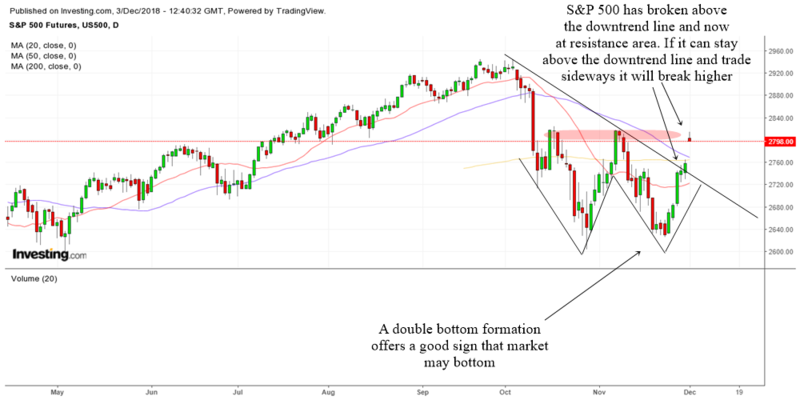 First of all, the S&P 500 has broken above a downtrend line and that is something encouraging for the bulls because a break above a downtrend line can signify the beginning of a new trend. What we need to see is for the S&P 500 to stay above the downtrend line. I do not know whether the market might correct sideways or correct down but as long as the S&P 500 stays above the downtrend line then it will be good. The S&P 500 is now at a resistance area. Though not a very strong one. If it can trade sideways a bit then it will go higher when it breaks out in the smaller time frame. Note the double bottom in the daily chart as well. If the double bottom really materializes, the target for the upward move will be somewhere above the all time highs which is good news for the bulls. The Dow is much more stronger than the S&P 500. It has also broke out above the downtrend line. If it can stay above this downtrend line and then form a bullish cross with the 20 MA crossing back above the 50 MA, I believe the market will continue moving higher and make new highs. Let us now look at the 60 min chart of the S&P 500. 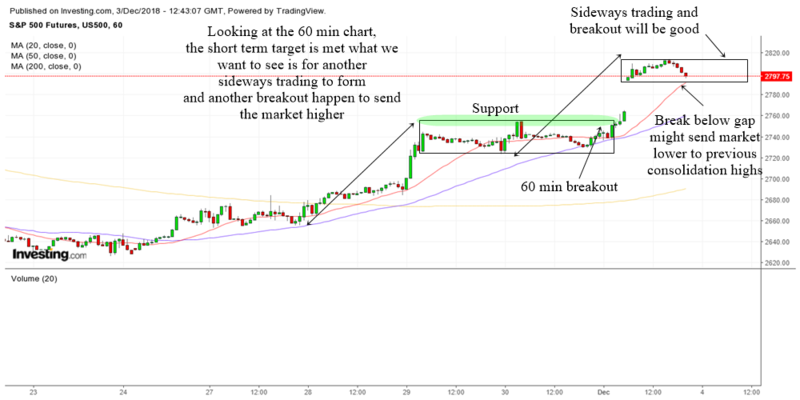 As you can see, the S&P 500 broke out above a recent 60 min consolidation. It has already met its short term target so what I prefer to see is for the S&P 500 to trade sideways a bit and then breakout again. If the S&P 500 breaks below the gap, then there might be a correction back down to the support area which I have highlighted in green. Hope this analysis will help you in this week's trading.